Diamond Chemical’s Laundry Division produces Alkalis, Detergents, Bleaches, Water Conditioners, Sours, Softeners, Starches, and Mildewcides. 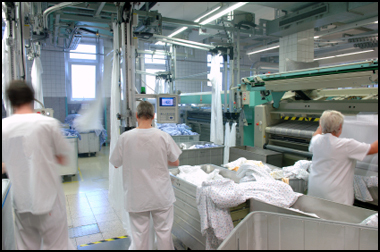 We combine our advanced chemical products with our proprietary state-of-the-art dispensing & reporting systems and add a specially trained Diamond Technical Representative to provide our customers with superior laundry processing. Our systems, ALIS™ CBW for tunnel washers and ALIS™ LITE for conventional washers, are the most accurate and reliable systems available today. 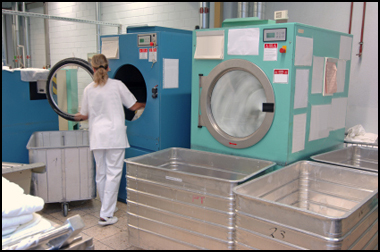 Additionally, our Paragon Product Line includes high quality chemicals used in Dry Cleaning, Shirt Laundry, On Premise Laundry, and Boiler Water Treatment. Our Paragon brand products are only sold through Diamond Chemical authorized distributors. These distinguished products are utilized in many nursing homes and hospitals in the United States. To inquire about becoming a Diamond Chemical authorized distributor or to find a distributor near you, contact us or call 1-800-OK4-SOAP.